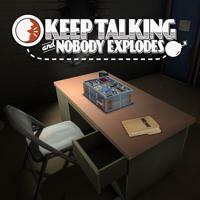 A cooperative puzzle game about defusing time bombs. One player (the “defuser”) can see and manipulate the bomb, while another (the “expert”) can read the manual that indicates how to defuse it. The players must communicate clearly and efficiently to correctly defuse the bomb before time runs out. The simple controls (and fact that the expert isn’t using a game system at all) make it approachable for inexperienced gamers and the asymmetric multiplayer means more players are likely to enjoy at least one of the available roles. Bombs are procedurally-generated, each containing a number of independent “modules” of about a dozen different types that each have their own rules. All modules must be solved before the bomb’s timer counts down to zero in order to defuse the bomb. Modules vary a lot in complexity, so the game’s difficulty curve is based on how many and which types of modules are present and how much time the players have. The simplest module is the basic “Wires” module, which has you asking questions like “How many wires are there?” and “Is the first wire yellow?” to determine which of several wires is the correct one to cut. The rules for solving most modules are deliberately arbitrary and obtuse, making the manual very difficult to memorize and meaning that both defuser and expert have a decent amount of complexity to manage even aside from communicating successfully. Some modules specifically make communication harder as well, such as the “Who’s On First” module which relies on homophones. Unusual for a co-op game, only one player is allowed to see the screen, which can present some setup challenges. With a VR setup on PC or PS4, you can just have the defuser wear the headset, but if you are using a TV you’ll have to put your experts somewhere they can’t see the screen but can still easily talk to the defuser. The Nintendo Switch actually provides an ideal solution since the defuser can just undock it and play in handheld mode. The manual is freely available online. It can be used on a computer or printed out (and there’s a purchasable collector’s edition as well). You can have multiple experts, but I did not find this a satisfying way to play. It’s difficult for the defuser to multitask and they can really only engage with one expert at a time. However, I think I am a particularly bad co-expert - the skills required of the expert are a little too close to some non-explosive-related work I’ve done in real life so I instinctively take over and don’t share well. Other players may have a better time teaming up. Much of the challenge comes from learning how the modules work and establishing efficient ways to communicate about them. The “Mazes” module is much easier if you agree on a way to reference grid coordinates, the “Keypad” module is similarly easier if you have shared names for the difficult-to-describe symbols it uses, and the “Memory” module is much easier when you understand what information needs to be communicated and remembered and what can be ignored. As such, while individuals can become more skilled at the game, what really matters is the communication between players. Once you’ve mastered a particular module with a particular partner, it quickly becomes less interesting - but switching to a new partner makes everything brand-new. I Stopped Playing When: I haven’t stopped. I can’t play by myself, but it’s my favorite party game. I bring my bomb manual and Switch every time I go see my friends who enjoy the game.